A comprehensive list of the species of fish we go fishing for here in Key West. Fish that we can target for you at certain times of the year and some even all year round. If you have any questions about the time you will be here, or the fish you would like to target. Feel free to give us a call. We will help guide you to the best fishing experience possible. 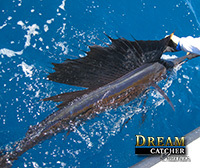 Or email us at info@dreamatchercharters.com we will get right back with you. To name every last species of fish that an angler can catch with us would be a monumental task. Here I am going to go over the main species we consider a target able fish. This means that on any given day if the species is in season or around, we can target them for you as an angler to catch. Broken down into several sections this comprehensive guide should take the guess work out of fishing in Key West. 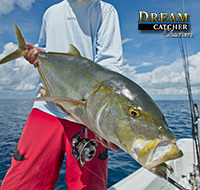 Remember to check out our Key West fishing Seasons guide to see what the fish are doing while you are here in Key West. We have great flats fishing year round the species vary from time to time. These are the sight fishing species we chase on the flats. The species in the backcountry fishing are similar to the flats with a few additions. These are the species of fish we can catch when fishing "out back". The reef and wreck trips hold a tremendous amount of opportunity for fishing species. Great table fare. Deep sea fishing in Key West is a tradition. Here are the species you can catch while trolling the deep blue waters. All of the fish species images below were fish actually caught on board our fishing charters. not borrowed from somewhere else..
We fish for tarpon all year round here at Dream Catcher Charters with huge success with the strongest months being between March and August. 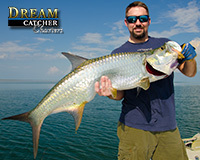 Ranging in size from 20 - 150 lbs we catch them on Live bait, Artificial and fly fishing. Known for their high flying aerobatics and hard puling fights tarpon have gained the attention of many anglers fishing in Key West making tarpon fishing season Super busy for us.. book in advance. We have specialty charters for tarpon fishing or you can add tarpon fishing to any one of our charters if they are available. If you have the patience, we have the permit here in Key West. Ranging in size from 10 - 40 lbs they are fast, powerful and very spooky, permit are the trophy of a lifetime for many shallow water fishermen. 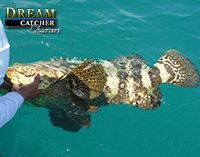 Caught while flats fishing and on deeper structures such as wrecks and patch reefs. We do both. Permit are always on our minds we are always prepared if they show up. To target permit book one of our technical flats fishing charters on board our flats boats and bay boats. The Florida Keys made bonefishing famous. Ranging in size from 3 - 12 lbs here in Key West bonefish are without a doubt one of the most popular of the Key West grand slam. Super fast and tons of fun on light tackle. To target bonefish book one of our bonefishing charters or our technical flats fishing charters on board our flats boats and bay boats. 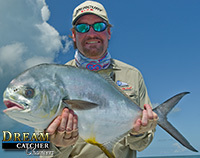 Under-sung hero of the flats and the number one replica mounted sport fish in the Florida Keys. Ranging in size from 2 - 30 lbs these fish are notorious for explosive hits, fast runs, big teeth and fun fights. We catch 'cudas on the flats, around shallow wrecks, deep sea fishing and in the backcountry. To target barracudas book one of our backcountry fishing charters or our technical flats fishing charters on board our flats boats and bay boats. A very strong fishery here in Key West the Sea Trout is huge entertainment and tasty sport fish. Ranging in size from 12 - 30 inches they have explosive hits on top water baits. Mixed in with the rest of our winter species in the backcountry the sea trout is a nice addition to the list. Our backcountry fishing charters are the best way to target the Spotted Sea Trout. Speedsters of the reef. Cero's are caught in areas where there are large bait concentrations. An excellent fight on light tackle or fly fishing and super good eating. World record cero mackerel are not out of the question here in Key West. To target cero mackerel book one of our backcountry fishing charters or deep sea fishing trips. Super Fast and always hungry. When these guys are in town no bait fish is safe. Ranging in size from 8 - 65 lbs these fish are a trophy with long hard runs, the larger ones are called Smokers as they try and burn the reels into smoke. Food fare they are OK smoked and the smaller ones cook well. Our reef fishing trips target these guys when they are in town. Deep sea fishing charters also target them. Can also be added to our All In Wonder fishing charter. Inshore running through the bait these fish hit anything fast. Great table fare with a hard fast fight. We use artificial lures for them and the hits are incredible. To target Spanish mackerel get out on one of our backcountry fishing charters in the cooler months. The All In Wonder fishing charter is also a great way to try for them. Great eating and fun to catch. Hard pulling fish that ranges from 10 - 80 lbs. Mostly caught on our shallow water wrecks sometimes a catch deep sea fishing. Cobia are known for excellent table fair. To target target Cobia book our Marquesas Keys fishing charter or the All In Wonder fishing trip. We call dolphin the chicken of the sea. fast growing and tasty. Fun to catch trolling and with light tackle. Dolphin are found offshore in the blue waters of the Gulf Stream. The total sport fish in blue water. Big jumps pretty fish and good fight with nice release. Sailfishing in Key West is a main staple for the deep sea fishing boats. We don't really like to take them out of the water for photos..
Sushi anyone? Our blackfin tuna fishery here in Key West is EPIC. On the reef and behind the shrimp boats. You decide we offer trips to get them in both arenas. Super tasty..
To target target blackfin tunas book our Wreck / Reef fishing charters or get out with one of our deep sea fishing boats and troll for them. The fastest fish in the ocean. A trophy and tasty catch when found they offer super fast runs that burn. What a great eating fish, wahoo are rarely released. To target target wahoo book our deep sea fishing charters. Some say the tastiest of the groupers. Bottom fish that loves live bait and to fight super hard. A deeper water species that we catch on our wreck and reef fishing trips. 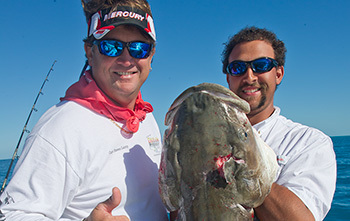 A gag grouper is a trophy grouper in any box. Season is closed from January through May. The most prized of all the groupers. The black grouper lives from 5 ft to 400 ft of water and get up to 130 lbs. We catch them on live bait and trolling. 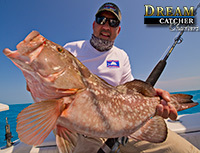 To target target Gag Grouper Reef fishing charters and the All In Wonder Fishing charter. Prevalent anywhere there is bottom structure at any depth. These guys not only fight really hard but they also love to come to dinner when in season. Sizes range from 1 - 25 lbs. Deeper waters bigger fish. Season Is closed From January through May. A by catch when we are fishing wrecks and large structure but they sure are fun to pull on. Goliath Groupers can weigh from 8 - 300 lbs. We catch them in the backcountry as well around the mangrove islands when targeting other species. Goliath Grouper have a protection by law. We are not allowed to harvest them. The tastiest and most popular of the snappers caught inshore and offshore. A special treat on artificial lure. Sizes range from 1 - 5 lbs and they pull like they weigh 20 with that huge tail. Fun to catch and awesome to eat, these fish are an incredibly fun, tasty fish to catch. To target Yellowtail snapper Book our signature All in Wonder fishing trip or the reef fishing trips. They are a by catch on our backcountry fishing trips. Lamb chops anyone. Besides being great table fare the mutton snapper is a beast on a fishing rod. Lots of fun to catch and huge reward. A tropical species of snapper very pretty and a tough fight. Sizes range from 1 - 17 lbs with some monsters in the 20lb range in deep water. Our reef fishing charters target all snappers. 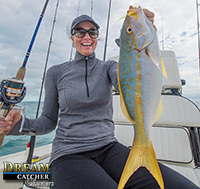 The All in wonder fishing charter is a great way to add them to the box. Our Backcountry fishing charters are also a great way to catch them. The smart jack. These fish can be a little picky on what they eat but once you get it right, its game on one right after another. Sizes range from 2 - 20 lbs. Strong as an amber jack, fast as a bonefish and pretty good eating. Yellow jacks are a nice addition to any days catch. Yellow Jacks are part of our backcountry fishing charters mostly. The All In Wonder fishing charter also targets them.